Drug utilization and cost research is used to guide and support policy decisions that improve the appropriate and effective use of pharmaceuticals and shape the affordability and sustainability of the Canadian health care system. Various Canadian administrative databases provide the raw data for this research through the reporting of prescription volumes, physical quantities of drugs and, sometimes, the days of treatment. From an analytical standpoint, these measures have certain limitations. The World Health Organization Defined Daily Dose (DDD) is a widely applied international metric that transforms the physical quantities of drugs (capsules, vials, inhalers, etc.) into a standard unit of measure. The DDD metric along with the ATC drug classification form a system which, if applied correctly, can be a powerful tool for analysing patterns of drug utilization and the quality of drug use and health outcomes. The purpose of this study is to inform researchers of the advantages and limitations of applying the DDD methodology when conducting drug utilization and costs analyses. In particular, it focuses on the application and interpretation of the DDD methodology in the context of Canadian administrative databases. The DDD is a technical, fixed unit of measure, defined as the assumed average maintenance dose per day for a drug used for its main indication in adults. While the DDD is generally expected to be in agreement with the recorded daily dose (RDD)1 in Canada, differences may exist for certain drugs, for specific segments of Canadian population or for particular time periods. Although it is not the purpose of this paper to assess the extent of such differences, this report makes use of examples to highlight the advantages and limitations of employing the DDD methodology in a Canadian context. Although real and consequential, the implications of such differences on the interpretation of Canadian drug utilization and cost analyses are sometimes difficult to recognize. If there is no evidence of agreement between the RDD and DDD, it should be assumed that there may be differences, and results based on the DDD methodology should be interpreted accordingly. Significant differences between the DDD and the RDD should not be interpreted as inappropriate drug utilization or as inaccurate DDD assignment, as they may be explained by other factors. A summary of the report´s recommendations on the use of the DDD methodology in Canadian drug utilization and cost analyses follows. 1 In this paper, the recorded daily dose (RDD) represents the prescribed or dispensed dose as recorded in the administrative database. In Canada, a large number of drug utilization and drug cost analyses are conducted using administrative databases. The proliferation of electronic records over the last decade has created extensive data holdings such as ex-factory shipments data, community and hospital pharmacy data, public and private drug plan claim data, medication error records and adverse drug reaction reports. The choice of an appropriate measure of drug use, whether expressed in terms of the number of prescriptions, the number of physical quantities or the treatment length, is fundamental to drug utilization research. Depending on the scope and purpose of the study, some of these measures are more suitable than others. The number of prescriptions – represents a broad measure of drug use, concealing important aspects of drug utilization, such as treatment length and quantity of drugs. The physical quantities of drugs – also known as ‘units´, represents a detailed measure of drug utilization. Pharmaceutical products comprise a large spectrum of formulations (tablets, vials, inhalers, etc.) and strengths, with varying units of measure (milligrams, millilitres, millimoles, etc.) and orders of magnitudes (e.g., tens, hundreds of milligrams). Since the units of measure are not uniform, the physical quantity may not adequately measure drug use across a group of drugs. The treatment length – Some administrative databases (e.g., drug plan or pharmacy data) may report the actual number of days of medication dispensed to patients (e.g., ‘days supplied´), providing a direct measure of drug use. However, this measure may not always be available, and when available, its reliability needs to be assessed before being reported. Since the application of conventional measures of use is limited, various organizations and research groups have developed standard units of measure. The World Health Organization Anatomical Therapeutic Chemical / Defined Daily Dose (WHO ATC/DDD) is now the accepted standard used by researchers throughout the world. The WHO ATC/DDD methodology transforms the physical quantities of drugs (capsules, vials, inhalers, etc.) into a standard unit of measure (defined as the daily dose). This enables researchers to assess trends in drug consumption and to perform comparisons between population groups. As part of the National Prescription Drug Utilization Information System (NPDUIS), the Patented Medicine Prices Review Board (PMPRB) has used the WHO ATC/DDD methodology to conduct various drug utilization and cost analyses. This has lead to a thorough understanding of how this standard should be applied in a Canadian context. The purpose of this study is to inform researchers conducting drug utilization and costs analyses of the advantages and limitations of the DDD methodology and how to best apply it and interpret the results when using Canadian administrative databases. The WHO ATC/DDD system is composed of the Anatomical Therapeutic Chemical (ATC) classification system and the Defined Daily Dose (DDD), which is a technical unit of measure. The ATC/DDD standard is a useful tool for comparing data on drug use at the international, national and/or local levels. The DDD is defined as the assumed average maintenance dose per day for a drug used for its main indication in adults. Drug consumption data presented in DDDs only give a rough estimate of consumption and not an exact picture of the actual drug use. This measure is generally employed for medication used in the treatment of chronic conditions. A result of 10 DDD per 1000 inhabitants per year is interpreted as follows: in a representative group of 1000 inhabitants, 10 DDDs of the drug are utilized, on average, on any given day of the year analyzed. This measure is normally employed for drugs generally used in acute treatment. A result of 10 DDD per inhabitant per year is equivalent to an average of 10 days of treatment with a certain medication per inhabitant per year. This measure is applied in analyses of in-hospital drug use. A result of 10 DDD per 100 bed days is the equivalent of 10% of the in-patients receiving the medication, on average, daily. The DDD is a technical, fixed unit of measure, which may not necessarily reflect the daily dose recorded in Canadian administrative databases. The reasons for the potential differences are highlighted in this section. DDD is defined as the assumed average maintenance dose per day for a drug used for its main indication in adults. The DDD is based on a review of the available information including the doses used in various European countries. 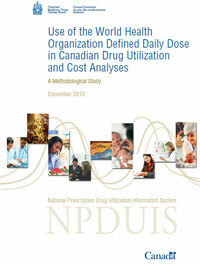 However, the DDD may not always mirror the patterns of drug utilization in Canada because of differences in the marketplace, such as marketed doses, demographics, approved indications, disease prevalence, clinical practice guidelines, reimbursement policies, prescribing practices and, for some drugs, the average body weight of the population. The WHO Collaborating Center indicates that doses for individual patients or patient groups will often differ from the DDD. Many Canadian administrative databases pertain to specific segments of the population, such as seniors, social assistance recipients, aboriginal populations, residents of specific areas/provinces, and patients receiving care in specific centers or working for specific employers. Given that the DDD is based on patterns observed in the general population, it may not reflect the actual drug utilization patterns of selected groups. According to the WHO, a major aim of the Collaborating Centre and Working Group is to maintain stable ATC codes and DDDs over time. This allows trends in drug consumption to be studied without the complication of frequent changes to the system. Changes in DDDs are to be kept to a minimum and avoided if the difficulties arising for users outweigh the benefits achieved by the alteration. The pharmaceutical marketplace is a dynamic environment where changes in the daily dose observed in a population may often occur. The average is based on two or more commonly used doses. Therefore, the DDD sometimes reflects a dose that is rarely, if ever, prescribed. Doses marketed in Canada may differ from those marketed in Europe. The maintenance dose is usually preferred when establishing the DDD. In reality, drug utilization encompasses both maintenance and starting doses, which may differ for some drugs. Other indications or any off-label use that may occur in real life are not captured in the DDD assignment. For drugs prescribed to both adults and children, only the adult dose is used in the DDD assignment. In these instances, the DDD value may not mirror the drug utilization patterns observed in groups that are only composed of children or in mixed population groups that include children. Children's doses are reflected in drugs prescribed only to children. Thus, although the DDD is generally expected to agree with the daily dose observed in a population, it is possible that this may not be the case for certain drugs, for specific segments of Canadian population or for particular time periods. If there is no evidence that two measures are in agreement, it should be assumed that differences may be present, and any results based on the DDD methodology should be interpreted accordingly. Significant differences between the DDD and the recorded daily dose observed in the Canadian population should not be interpreted as drug misuse or as inaccurate DDD assignment, as there may be many valid reasons for the discrepancies. Past studies (see Muller et al. 2006; Dalton et al. 2007) have identified examples of significant differences between the DDD and the prescribed daily dose in selected groups of drugs and populations. It is not the purpose of this study to evaluate the extent to which the DDD may or may not reflect the utilization patterns observed in Canadian administrative databases. However, some examples of significant disparities are provided in this section along with an indication of the implications of such disparities on the interpretation of Canadian drug utilization and costs. For consistency and simplicity, the examples focus on a particular group of drugs, the HMG CoA2 reductase inhibitors, commonly referred to as statins. The use of these drugs is observed in Canada's largest public drug program, the Ontario Drug Benefit (ODB) Program. The examples focus on this program because of the availability of data, both in terms of the time period (10 year) and the data elements (e.g., days supplied information). Nevertheless, as the analysis provided in Appendix 2 substantiates, similar utilization patterns have been observed in other public drug programs, for example, in New Brunswick and Nova Scotia. The provincial administrative database that was used reports on claims, drug utilization and expenditures reimbursed under the public drug programs. The information reported is as dispensed by Canadian pharmacies. Therefore, the analysis focuses on the average recorded daily dose (RDD)3 observed in drug plan data. This measure is compared to the DDD. The DDDs for statins remained unchanged during the 10-year period analyzed in this study (fiscal years 1997-98 to 2006-07)4 and through 2008. Thus, the WHO ATC/DDD January 2008 edition was used for this report. In January 2009, important alterations to the DDDs came into effect for five of the six statins in order to better reflect the recorded daily dose. Appendix 4 provides a comparison of the new and previous DDD values in the context of the ODB program database. Example Box 1 illustrates a case study in which there are significant differences between the DDD and the RDD. The ODB program data suggests that over the 10-year period ending in 2006-07, there has been a sustained upward trend in the average recorded daily dose (RDD) for most statins. This is likely due (but not limited) to changes in the clinical practice guidelines and the Health Canada approved product monographs, as well as new, higher doses of the existing drugs (e.g., an 80 mg tablet for atorvastatin and simvastatin). For example, the starting dose of simvastatin in the treatment of coronary heart disease, initially recommended by the Health Canada approved monographs at 20 mg/day, was increased in 2005 to 40 mg/day (CPhA 1997-2007). The Canadian clinical practice guidelines issued during the past decade have called for an increasingly greater reduction in the target lipid levels for high-risk patients (10-year risk of coronary artery disease ³ 20%). In 2003, the guidelines recommended that high-risk patients target a LDL-C level of £ 2.5 mmol/L (Genest et al. 2003). This represented a tighter control level for the group of patients with a 10-year CAD risk in the 20-30% range (the 2000 guidelines recommended a LDL-C target level of £ 3.0 mmol/L (see Fodor et al. 2000)). By 2006, the LDL-C treatment target for high-risk patients was further reduced to £ 2.0 mmol/L (McPherson et al. 2006). These higher target LDL-C values often necessitated increased doses of statins, among other interventions. Given the notable transformations that the statin market has experienced, a stable standard unit of measure such as the DDD could not reflect the actual patterns of utilization at all times. Figure E1 reports on the trend in the percent difference between the DDD and the average RDD in the ODB program during the 1997-98 to 2006-07 period. It should be noted that DDDs are never expected to be an exact depiction of the daily dose observed in a population. Differences, however, are expected to be minimal. For the most part, the RDD for statins has been somewhat comparable to the DDD, in the range of an absolute (±) 8-32% difference (for drugs such as pravastatin, rosuvastatin, lovastatin and fluvastatin). The RDD for simvastatin was initially the most comparable to the DDD (8% difference); however, there is now a considerable difference (67% by 2006-07). Although increased drug exposure would have initially explained the difference in the two values, recent analyses may be impacted by the significant differences between the DDD and the RDD for simvastatin. Atorvastatin, which has become the best selling drug in the statin market, had the most significant difference between the DDD and RDD. Even as far back as 1997-98, the RDD (16.2 mg) was 62% higher than the DDD (10 mg). Ten years later, the RDD (20.6 mg) was more than double the DDD. The next analysis further focuses on this class, examining the implications of both small and large differences between the RDD and the DDD on the interpretation of Canadian utilization and costs. It should be noted that these patterns are not limited to the Ontario drug program. As Appendix 2 suggests, similar results are observed in other groups, such as the New Brunswick and the Nova Scotia drug programs. 3 In this paper, the recorded daily dose (RDD) represents the prescribed or dispensed dose as reported in the administrative database. 4 A fiscal year in this case is defined as a 12-month period beginning on April 1 of the first year and ending on March 31 of the following year. 5 The utilization associated with cerivastatin is not reported, as it has been minimal and temporary due to market withdrawal. There are numerous areas of drug utilization analysis for which the DDD methodology can be effectively used, ranging from simple analyses of trends in exposure rates at drug level to complex comparisons and analyses of exposure rates across drugs or groups of drugs and populations. The DDD metric along with the ATC drug classification compose a system which, if applied correctly, can be a powerful tool in acquiring knowledge of utilization patterns and improving the quality of drug use and health outcomes (WHO 2004a). This section focuses on the appropriate use of the DDD metric in the analysis of data derived from Canadian administrative databases: areas of study for which the DDD methodology is most appropriate, areas for which the methodology should be applied and interpreted with caution, and areas for which the methodology should not be used. Example Box 2 and Example Box 3 demonstrate the limitations of applying the DDD methodology in interpreting Canadian drug utilization when there are significant differences between the DDD and the recorded daily dose. Example Box 2 illustrates a simple example of the utilization of single drug and formulation with one corresponding DDD. Example Box 3 depicts the less obvious implications arising from the analysis of multiple drugs and formulations. Although real and consequential, these implications are difficult to recognize, especially in comprehensive analyses where the utilization of large numbers of drugs is aggregated. The days supplied information reported in the ODB data suggests that atorvastatin is generally dispensed once-daily regardless of the dosage strength (10 mg, 20 mg, 40 mg or 80 mg), which corresponds to the Health Canada approved product monograph. However, as noted in the previous section, the average recorded daily dose (RDD) was over twice as high (106%) as the DDD in the ODB program in 2006-07. As Table E2.1 indicates, this difference translates into a corresponding gap between the total number of RDDs and the calculated total number of DDDs (135.1 million versus 278.2 million). The latter is a theoretical value and should not be interpreted on its own. The calculated total number of DDDs is usually converted into DDDs per 1000 people per day. In the case of the ODB program, people can be defined as beneficiaries or individuals who have been reimbursed by the program. Thus, the number of DDDs per 1000 beneficiaries per day for atorvastatin was 335 in the ODB program in 2006-07. This may be interpreted as follows: a representative group of 1000 ODB beneficiaries has an average daily exposure to atorvastatin of 335 DDDs. Given that atorvastatin use in the ODB program does not correspond to the DDD standard, it should not be assumed that 335 beneficiaries out of 1000 are utilizing it, on average, on any given day. The number of RDDs per 1000 ODB beneficiaries per day is actually 163. Morbidity is sometimes inferred based on the DDD per 1000 people per day. However, as illustrated, morbidity should only be inferred when there is minimal difference between the DDD and the RDD. Nevertheless, drug exposure expressed in DDDs is valuable in comparative analyses. For instance, as Table E2.2 suggests, there has been a 13.2% increase in exposure to atorvastatin (number of DDDs per 1000 ODB beneficiaries per day) over the 2005-06 to 2006-07 period. Apart from the 8.6% increase in the number of RDD per 1000 beneficiaries per day, the 13.2% increase in drug exposure also reveals an increased utilization of the higher strengths of atorvastatin. Note that when a single drug and formulation is analyzed with a single corresponding DDD, the interpretation of drug exposure determined through the DDD methodology is the same as simply cumulating the amount of the drug (milligrams, millilitres, etc.) that is prescribed/dispensed. The DDD methodology is most useful in the analyses of groups of drugs and/or formulations where the physical quantities of the drugs are not cumulative. These instances would involve multiple DDDs (see Example Box 3). This group of drugs has been characterized by both remarkable increases in utilization and shifts in the dominant products over the 10-year period ending in 2006-07. As Table E3 indicates, in 1997-98 there were three products dominating the market with somewhat comparable market shares (in terms of units/pills): simvastatin (33%), pravastatin (30%) and lovastatin (26%). The newly launched atorvastatin initially captured a small share of the market (7%), but by 2006-07 it emerged as the dominant product, with well over half of the market (59%), followed distantly by simvastatin (18%) and rosuvastatin (14%). Figure E3 reports the 10-year growth rate in the utilization of statins by ODB beneficiaries. The results are reported per 1000 beneficiaries per day. Drug utilization is expressed in various measures of exposure: unit (pill), treatment and drug exposure. The 283% increase in unit exposure suggests that nearly four times more statin pills are taken per 1000 ODB beneficiaries in 2006-07 than in 1997-98. This is somewhat comparable to the 324% increase in days of treatment exposure. The increase in drug exposure based on these two measures, while comparable (407% and 437%, respectively), is remarkably lower than that determined using the DDD standard (627%). This is explained by the changing weights in utilization from drugs with smaller differences between the DDD and the RDD (e.g., pravastatin, lovastatin and simvastatin) to drugs with much larger differences between these two measures (e.g., atorvastatin) – (Table E3). Depending on the unit of measure considered, drug exposure results and conclusions may differ. Using ODB RDD standards, drug exposure for statins in the ODB program has increased by a factor of 5.37 over the 10-year period. Using DDD standards, the drug exposure has increased by a factor of 7.27. Minimal Can be used to interpret the volume of drug utilization expressed in DDDs The DDD may be used to make assumptions of the number of treatment days of medication in a population and the time period. Can be used to infer the percent change or differential in the volume of drug utilization expressed in DDDs For example, trend analyses and comparative analyses of drug exposure across drugs in a population or across population groups. Can be used to infer morbidity based on medications used in the treatment of chronic conditions and acute conditions with a known standard treatment Past research suggests that the DDD methodology is a valuable first step in the measurement of overall drug use, but for more precise estimates of drug use it must be supplemented by other techniques. Significant Should not be used to interpret the volume of drug utilization expressed in DDDs The DDD is a theoretical measure of drug use and the volume expressed in DDDs becomes a theoretic value. Can be used to infer the percent change or differential in the volume of drug utilization expressed in DDDs Caution should be exercised when the drugs analyzed have varying degrees of disparity between the DDD and the daily dose observed in the population. Should not be used to infer morbidity The DDD is a theoretical measure of drug use and the volume expressed in DDD becomes a theoretic value. Generally, the DDD methodology should not be used to interpret the volume of drug utilization expressed in DDDs (for example, for inferring treatment length for individual patients, unless the conclusions of the study would not be impacted by potential differences between the DDD and the daily dose observed in the population). The application of the DDD methodology to cost analyses is very limited, as the DDD is a technical drug-use metric. Unlike drug utilization analyses in which the DDD methodology can provide valuable drug exposure information even when there are differences between the DDD and the recorded daily dose, in cost analyses even small differences between these two measures may lead to erroneous conclusions. “The DDD is a technical drug use metric and is not designed necessarily to reflect therapeutically equivalent doses of different drugs which are very difficult to establish, especially at the precision usually required for pricing decisions”. Thus, the application of the DDD methodology can impact a broad array of cost analyses, with misuses likely to occur in the following: cost per DDD analyses, cost decomposition analyses, pharmacoeconomic studies, and budget impact analyses. Example Boxes 4 through 6 illustrate the limitations of applying the DDD methodology in cost analyses. Note that the cost reported in these examples includes the ingredient cost and the wholesaler and pharmacy mark-ups. From 1999-00 to 2000-01, the DDD for simvastatin (15 mg) was comparable to the average recorded daily dose (RDD) in the ODB program, which was in the range of 17.6–18.6 mg. In this case, the cost per DDD can provide a rough idea of the average daily cost of utilizing the drug (Figure E4), that is, approximately $1.70–$1.80. This result is somewhat in line with the average cost per unit and average cost per RDD. Given the loose interpretation that should be applied to results based on the cost per DDD, variations in these results across time periods or populations should generally not be interpreted. For instance, the 5.1% reduction in the cost per DDD observed over the one-year period should not be interpreted as a reduction in the cost of taking simvastatin, as it is driven by an increase in the utilization of higher strengths (which are less expensive on a per DDD basis). As both the average cost per unit (standardized for changes in the distribution of the unit doses utilized) and the cost per RDD suggest, the cost of utilizing the drug has slightly increased over the period analyzed. As previously indicated, in the case of atorvastatin, there is a large difference between the DDD of 10 mg and the average recorded daily dose (RDD) in the ODB program, which has steadily increased from 16.2 mg to 20.6 mg during the 10-year period. As Figure E5 indicates, by 2006-07, the average cost per DDD for atorvastatin had dropped to less than $1.00, which is approximately half of the average cost per unit or RDD. This is due to the division of the cost of the higher strengths of the drug (20 mg, 40 mg and 80 mg) into multiple DDDs. Unquestionably, in this case, the average cost per DDD should not be interpreted. Furthermore, the cost of using atorvastatin has increased during the 10-year period, as indicated by the percent difference in the average cost per unit (+7.7%), the average cost per unit standardized for changes in the distribution of the unit doses utilized (+2.6%), and the cost per RDD (+3.5%). The cost per DDD, on the other hand, has dropped by 18.5%, erroneously suggesting a remarkable reduction in the cost of atorvastatin. This counterintuitive result is explained by an increased utilization of the higher strengths of the drug (20 mg, 40 mg and 80 mg) over the study period, which on a per DDD basis are less expensive than the lowest strength (10 mg), thus diluting the average cost. The ODB 2006-07 data indicates that the cost of utilizing rosuvastatin was markedly lower than that of atorvastatin when measured either per unit (-24.1%) or per RDD (-26.0%) (see Table E6). However, the cost per DDD suggest the opposite interpretation, namely, the cost of utilizing rosuvastatin was markedly higher (+21.2%) than atorvastatin. This counterintuitive result is explained by the fact that the DDD and the RDD are more comparable in the case of rosuvastatin than atorvastatin (Figure E1). There have been studies that report and compare the cost per DDD for drugs, groups of drugs or populations (see Goel et al. 1996; Metge et al. 2003). If there is agreement between the DDD and the RDD, the cost per DDD can provide a rough idea of the treatment cost. However, if the extent of agreement is unknown, caution should be used when interpreting the results. The DDD methodology can be used to make assumptions, for instance, on the cost per dose when dealing with missing or inaccurate data in a dataset (Lummis et al. 2008). However, this application is valid only if the DDD is in line with the RDD or if the results are not likely to be impacted by potential differences between the two measures. In the past, the PMPRB has conducted cost decomposition analyses based on the DDD methodology and has identified important limitations in this context (PMPRB 2006). Cost decomposition analyses are most commonly referred to as cost driver analyses, as they break down the change in drug costs into its driving factors (effects or determinants). They are generally conducted on overall use, but they can also be conducted on a group of drugs (such as therapeutic classes). Depending on the availability of data, cost driver analyses generally quantify the volume effect, the price effect, the demographic effect and the therapeutic effect. Each effect is extracted through a complex mathematical formula for which the main components are the price and the quantity of drugs utilized, as well as their corresponding weights. Volume Effect – The volume effect quantifies the contribution to changes in total drug costs due to changes in the volume of drug utilization. As previously indicated, significant differences between the DDD and the RDD should be taken into account when interpreting the volume of drug use. This is likely to occur in comprehensive analyses, such as cost driver analyses, in which a large number of drugs are considered. Therapeutic Mix Effect – The therapeutic mix effect quantifies the contribution to changes in total drug cost due to shifts in utilization towards lower or higher cost drugs. When the DDD methodology is applied in this framework, the cost of each drug is determined at the DDD level and the cost per DDD is compared across drugs. Using the case illustrated in Example Box 6, consider a cost driver analysis of the ODB program from 2005-06 to 2006-07 during which time there has been a shift in utilization from atorvastatin to rosuvastatin. The cost of rosuvastatin (expressed either in units or RDDs) is lower than atorvastatin. Therefore, the therapeutic effect should have a negative impact on drug costs as a shift toward a lower cost drug would result in cost savings. However, if the DDD methodology is applied in this analysis, the cost per DDD of rosuvastatin (expressed in DDDs) appears to be higher than atorvastatin. Thus, a shift from atorvastatin to rosuvastatin would erroneously translate into a therapeutic effect with positive impact on drug costs, namely, being interpreted as a contributor to cost increase. As the WHO indicates, and as the analysis provided in this section substantiates, the use of the DDD metric to compare costs of different drugs generally produces invalid or questionable results. Therefore, unless the DDD accurately reflects the RDD, the DDD methodology is not appropriate for use in cost decomposition analyses. These studies serve to guide optimal healthcare resource allocation in a standardized and scientifically grounded manner. They evaluate the cost and the effects (monetary value, efficacy or enhanced quality of life) of pharmaceutical products. There are several types of pharmacoeconomic evaluations: cost of illness, cost–benefit, cost-effectiveness, cost-utility and cost-minimization analyses. The WHO indicates that the classification of a substance in the ATC/DDD system does not imply judgments about efficacy or the relative efficacy of drugs and group of drugs. Therefore, the DDD is not an appropriate measure to be used in cost-of-illness, cost–benefit, cost-effectiveness and cost-utility analyses, as these are based on data regarding the equivalency of surrogate or final outcomes ( Clarke and Gary 1995). Even in the simplest pharmacoeconomic study, cost-minimization, where the outcomes are assumed equal, the comparison of treatment costs based on a theoretic measure of drug use (DDD) may offer only a limited value in guiding policy decisions (as suggested in Example Box 5). These analyses are used by Canada's public and private drug plans to predict and understand the potential financial impact of introducing a new pharmaceutical product or approved indication into a drug reimbursement system that has finite financial resources. The methodology of estimating the budgetary impact is quite complex, but the main idea is to compare the treatment cost of the new pharmaceutical or new approved indication with its comparator drugs. The PMPRB in its Budget Impact Analysis Guidelines (PMPRB 2007) emphasizes the importance of the reliability of the assumptions and parameters in estimating the budgetary impact. The assumption of treatment cost has to depict the reality of the plan as accurately as possible. As shown in this section, the cost determined at the DDD level has major limitations. The DDD is a technical unit of measure and not a measure of treatment. Therefore, unless the DDD accurately reflects the RDD, the DDD methodology should not be used in budget-impact analyses. Minimal Provides a rough idea of the daily cost of utilizing a drug in a specific formulation Caution should still be used, as misinterpretation of the results based on the DDD methodology may still occur. Significant Should not be used in cost analyses The DDD methodology is usually not valid in analyses of the cost differential across drugs or groups of drugs, unless the differences between the DDD and the RDD are not expected to impact the interpretation of results. The DDD methodology should not be used in guiding policy decisions regarding reimbursement, therapeutic substitution and other pricing decisions. The advantages and limitations of applying the DDD methodology in the context of Canadian administrative databases have been discussed before (Sketris et al. 2004). This section provides a detailed overview of these advantages and limitations in light of the analysis provided in Section 2. Further detailed analysis is provided in Appendix 1. The main advantage of the DDD methodology is that it converts the physical quantities of drugs into a standard unit of measure. This allows for the aggregation of drug utilization across groups of drugs, which may not otherwise be possible. The DDD is a measure of drug exposure and captures the treatment intensity in the analyzed population. It enables researchers to assess trends in drug consumption and to perform comparisons between population groups. However, as previously indicated, caution should be exercised when interpreting results based on this methodology if there are significant differences between the DDD and the RDD. The DDD is assigned by the WHO Collaborating Centre for Drug Statistics Methodology in collaboration with WHO International Working Group for Drug Statistic Methodology. The WHO is a world-renowned organization and the DDD methodology is widely accepted and applied. As part of the WHO ATC/DDD system, the DDD methodology has a direct link to a widely accepted and used therapeutic classification system. The WHO ATC/DDD system is updated every January, with additions of new drugs and reviews/changes. The WHO ATC/DDD system is inexpensive and data can be obtained within days. The ATC codes are alphanumerical and categorical; thus, for the most part, they are easy to use and intuitive. The WHO ATC/DDD system classifies drugs and provides DDDs at a very granular level (ingredient and route of administration). Thus, it can be potentially integrated with a wide range of Canadian administrative databases. The DDD is an assumption of drug use, which, for many valid reasons, may not necessarily reflect the drug utilization patterns observed in Canadian administrative databases. When there is a known discrepancy between the RDD and the DDD, it must be taken into account when interpreting drug consumption figures. The application of the DDD methodology in cost analyses is very limited, as the DDD is a technical drug-use metric. If the DDD is in agreement with the RDD, the cost determined at the DDD level may provide a rough estimate of the daily cost of taking a specific formulation of a single drug or cost differential between the two formulations of the same drug. However, this metric can give invalid results when comparing costs of different drugs or drug groups. The WHO ATC/DDD system has been created as a tool for drug utilization research in order to improve the quality of drug use. The WHO indicates, however, that the ATC/DDD system is not suitable for guiding decisions regarding reimbursement, pricing and therapeutic substitution. The DDD should not be used to infer therapeutic equivalence, as the two notions have different meanings and purposes. The DDD is an average of drug-use metric; whereas, therapeutic equivalence refers to doses of different drugs that achieve the same control of a symptom or illness. Therapeutic equivalence is determined based on a rigorous analysis of the results of clinical trials. While two drugs may have the same DDD, they should not be interpreted as being therapeutic equivalents, as therapeutically equivalent doses may actually differ. In general, such policy decisions are based on therapeutic equivalence, pharmacoeconomic studies and cost comparisons of different drugs based on actual RDDs. This limitation is technical in nature and can be alleviated with a proper integration process. However, the process can be quite complex, time consuming and resource intensive (requiring extensive programming resources as well as clinical and policy expertise). Moreover, the process may not result in complete DDD assignment. A DDD assignment may be unavailable for certain drugs. Thus, if the DDD methodology is used for comprehensive analyses on Canadian administrative databases, some potentially significant drug utilization may not be captured. For such studies, it is important that this potential omission is noted in the results. Appendix 1 details the three main challenges that need to be addressed in order to integrate the DDD into Canadian administrative databases: (1) dealing with unavailable DDDs, (2) integrating available DDDs, and (3) unit reporting standardization. Although it is the intention of the WHO to maintain a stable ATC/DDD system, changes do occur. Studies applying the DDD methodology do not always reference the DDD values or the ATC/DDD edition used (see Ronning et al. 2000). This makes it difficult to compare results across studies, as the DDD assignment may differ from one edition to another. Studies applying the DDD methodology should properly indicate the WHO ATC/DDD edition used (Ronning 2001). Health Canada has integrated the ATC classification into its Drug Product Database (DPD) by providing a direct link between the DIN (Drug Identification Number) and the ATC system. The DDD values, however, are not presently linked with the DPD. The WHO ATC/DDD system is a valuable tool for conducting drug utilization research in Canada including trend, regional, jurisdictional and international comparative analyses. Researchers should be aware of the advantages and limitations of the DDD methodology and apply a balance to their research endeavors. The inclusion of the WHO ATC classification into the Health Canada Drug Product Database is a valuable contribution to Canadian drug utilization research. The addition of the DDD information to this database would allow researchers to fully benefit from the WHO ATC/DDD system. This would partially alleviate the limitations pertaining to the DDD integration in Canadian administrative databases. Alleviating the rest of the limitations pertaining to the DDD integration in Canadian administrative databases can be accomplished at the data input level, by promoting standardized reporting of drug use, in terms of drug identification, quantity information, etc. Furthermore, expanding the data reporting capacity to include information on the actual treatment length (e.g., the number of days of medication prescribed or dispensed) would provide researchers and policy makers with a valuable direct measure of the daily doses in Canada. This measure can be used in trend analyses and international studies, as well as comparisons with the DDD measure. As indicated in this report, there are important limitations to the use of the DDD methodology in drug utilization and cost analyses. These limitations need to be carefully considered in the context and scope of each research endeavor before employing the DDD methodology. Analyses of Canadian drug utilization and cost using the DDD methodology should clearly indicate any limitations and should outline how they may impact the interpretation of the results. Studies should also indicate the WHO ATC/DDD edition that was used. Clarke KW, Gary D. 1995. The defined daily dose as a tool in pharmacoeconomics. Advantages and limitations. PharmacoEconomics, 7(4): 280–283. Cooke C, Nissen L, Sketris I, Tett SE. 2005. Quantifying the use of statin antilipemic drugs: comparison of and contrasts between Nova Scotia, Canada, and Queensland, Australia. Clinical Therapeutics 27(4). CPhA. 1997–2007. Compendium of Pharmaceuticals and Specialties, 1997–2007 ed. Canadian Pharmacists Association. Dalton B, Sabuda D, Conly J. 2007. Trends in antimicrobial consumption may be affected by units of measure. Chicago Journals – Clinical Infectious Diseases 45: 399–400. Fodor JG, Frohlich JJ, Genest JJG, McPherson PR for the Working Group on Hypercholesterolemia and Other Dyslipidemias. 2000. Recommendations for the management and treatment of dyslipidemia: Report on the working group of hypercholesterolemia and other dyslipidemias. Canadian Medical Association Journal, 162(10): 1441–1447. Genest J, Frohlich J, Fodor G, McPherson R (the Working Group on Hypercholesterolemia and Other Dyslipidemias). 2003. Recommendations for the management of dyslipidemia and the prevention of cardiovascular disease: update. Canadian Medical Association Journal, 169(9): 921–924. Levy AR, O´Brien BJ, Sellors C, Grootendorst P, Willison D. 2003. Coding accuracy of administrative drug claims in the Ontario Drug Benefit database. Canadian Journal of Clinical Pharmacology 10(2). Lummis HL, Sketris IS, Gubitz GJ, Joffres MR, Flowerdew GJ. 2008. Medication persistence rates and factors associated with persistence in patients following stroke: a cohort study. BMC Neurology, 8:25. McPherson R, Frohlich J, Fodor G, Genest J. 2006. Canadian Cardiovascular Society position statement Recommendations for the diagnostic and treatment of dyslipidemia and prevention of cardiovascular disease. Canadian Journal of Cardiology 22(11): 913–927. Merlo J, Wessling A, Melander A. 1996. Comparison of dose standard units for drug utilization studies. European Journal of Clinical Pharmacology 50:27–30. Muller A, Monnet DL, Talon D, Heron T, Bertrand X. 2006. Discrepancies between prescribed daily dose and WHO defined daily dose of antibacterials at a university hospital. British Journal of Clinical Pharmacology 61(5): 585–591. Ronning M. 2001. Coding and classification in drug statistics—From national to global application. Norwegian Journal of Epidemiology 11(1): 37–40. Ronning M, Blix HS, Harbo BT, Strom H. 2000. Different versions of the anatomical therapeutic chemical classification system and the defined daily dose – are drug utilization data comparable? European Journal of Clinical Pharmacology 56: 723–727. Sjoqvist F, Brikett D. 2004. ‘Drug Utilization´, in The IUPHAR Compendium of Basic Principles for Pharmacological Research in Humans (Chapter 10). International Union of Basic and Clinical Pharmacology, pp. 76–84. Sketris IS, Metge CJ, Ross JL, MacCara ME, Comeau DG, Kephart GC, Blakburn JL. 2004. The Use of the World Health Organization Anatomic Therapeutic Chemical/Defined Daily Dose Methodology in Canada. Drug Information Journal 38: 15–27. Smith AJ, Sketris I, Cooke C, Gardner D, Kisely S, Tett SE. 2008a. A comparison of benzodiazepines and related drug use in Nova Scotia and Australia. The Canadian Journal of Psychiatry 53(8). Smith AJ, Sketris I, Cooke C, Gardner D, Kisely S, Tett SE. 2008b. A comparison of antidepressant drug use in Nova Scotia and Australia. Pharmacoepidemiology and Drug Safely 17: 697–706. Wessling A, Boethius G. 1990. Measurement of drug use in a defined population, Evaluation of the Defined Daily Dose (DDD) methodology. European Journal of Clinical Pharmacology 39: 207–210. WHO. 2004a. Guidelines for ATC classification and DDD assignment, 7th ed. World Health Organization Collaborating Centre for Drug Statistics Methodology, p. 34.
WHO. 2004b. Guidelines for ATC classification and DDD assignment, 7th ed. World Health Organization Collaborating Centre for Drug Statistics Methodology, p. 31.
WHO. 2004c. Guidelines for ATC classification and DDD assignment, 7th ed. World Health Organization Collaborating Centre for Drug Statistics Methodology, p. 33. DDDs are only assigned to drugs that have been assigned an ATC. However, not all drugs have an ATC assigned. In addition, there are drugs that have been assigned an ATC, but not a DDD. The WHO Collaborating Centre establishes new entries in the ATC classification based on requests from the users of the system (e.g., manufacturers, regulatory agencies, researchers). Drugs without an ATC are drugs for which a request has not been received. Therefore, the system is not comprehensive. The Health Canada Drug Product Database (DPD) contains product specific information on drugs approved for use in Canada that have been assigned a Drug Identification Number (DIN). Amongst other information, this database provides the available ATC code for each DIN. Approximately one quarter of the DINs for human use listed in the Health Canada DPD have no ATC assigned by the WHO Collaborating Centre. However, the overwhelming majority of these drugs are not currently used in Canada, and the rest represent an insignificant share of Canadian drug utilization. Some administrative databases may need to integrate the Health Canada DIN information. Once this is complete, the integration of the ATC therapeutic classification is a simple linkage. The overwhelming majority of drug utilization should then pertain to drugs for which an ATC code is assigned. Administrative databases may report on the use of pharmaceutical products that do not have a Health Canada DIN. Such products may include pharmacy-compounded products and devices (such as diabetes test strips, syringes, etc.). A so called pseudo-DIN may be assigned to these products. The WHO only assigns a DDD for drugs for which there is already an ATC assigned. However, DDDs are not established for topical preparations, sera, vaccines, antineoplastic agents, allergen extracts, general and local anesthesia and contrast media, as well as some combination products. Therefore, there are drugs with an ATC code that do not have a DDD. The majority (65%) of ingredients that have been assigned an ATC code have not been assigned a DDD. Nevertheless, the analysis conducted on the NPDUIS Database for selected public drug plans suggests that these drugs generally account for a relatively small share of drug utilization. As Figure A1 indicates, just over 10% of the drug cost and number of prescriptions in Saskatchewan and Manitoba in the 2006-07 fiscal year were for drugs that did not have a DDD. In New Brunswick and Nova Scotia, the corresponding values are in the 6.1–7.7% range. The side box provides the list of the top drugs with an ATC but without a DDD in the analyzed data. In conclusion, comprehensive drug utilization studies conducted on data contained in administrative databases based on the DDD methodology inevitably exclude drugs that do not have an assigned DDD. The extent of the exclusion should be indicated when reporting results, since the conclusions drawn from a subset of data may be different than those drawn from a complete data set. Drugs with an ATC and an assigned DDD can be integrated into Canadian administrative databases. However, when two data sources are being integrated, there may be differences in reporting that need to be standardized. Unit 'U' – the unit of measure for quantity: g, mcg, mg, mL, mmol, etc. Similar descriptive information along with drug utilization data are generally reported in Canadian administrative databases. However, the way it is reported may differ significantly, with discrepancies in the ingredient name description, the route of administration description and unit of measure. Extensive resources (mainly clinical and programming) are required to completely standardize these types of information in order to completely integrate Canadian administrative databases with the WHO ATC/DDD system. Health Canada has already started this process by linking the Health Canada DINs to the corresponding ATC classification. While the integration of the ATC classification system generally requires standardization and linkage of the ingredient information (with few exceptions), the integration of the DDD system is more complex. It requires even further standardization and linkage of the information pertaining to the form, as well as the unit of measure for quantity. Simply integrating the ATC classification does not mean that the DDD is also integrated, as there are instances in which a single ingredient and ATC level (see Table A1) may have multiple DDDs. DDD information has not yet been integrated in any publicly available Canadian database. Researchers applying the DDD methodology must undertake this standardization process. When the scope of the project is limited to a group of drugs, the DDD integration process may be easily done on a drug-by-drug basis. However, for comprehensive studies that analyze overall drug utilization and require complete DDD integration of thousands of drugs, a combination of automatic linkage through programming and a thorough drug-by-drug association factoring in clinical expertise is required. The DDD methodology relies on unit information (physical quantities of drugs) as reported in the drug utilization data. However, because of the variety of ways in which the unit information can be expressed and because an automatic reporting process is not available, this information field is prone to inconsistent reporting. For instance, the use of etanercept in a 50 mg/mL vial form may be keyed in as 1 (vial) or as 50 (mg). Thus, the drug utilization data may contain a mixture of these two methods of reporting. Before converting the number of units for etanercept into DDDs (the DDD for etanercept is 7 mg), the reported unit information needs to be consistent. This means, converting the 1 (vial) reporting to 50 (mg). This ensures that all drug use is reported in the same unit of measure. Unit information standardization may prove to be a very time-consuming and resource-intensive process, especially in overall drug utilization studies with numerous observations. However, unit information quality assurance is essential when applying the DDD methodology. Given that the unit reporting discrepancies occur at observation level (e.g., prescription or claim level), the unit standardization process needs to be at this level, as opposed to applying it to aggregate data. However, if the data is only available at the aggregate level and the unit consistency process has not been previously applied, the analysis may have to be restricted to groups of drugs where inconsistent reporting is unlikely to occur, such as oral solids—exceptions being drugs that can only be dispensed in a certain number of pills (e.g., oral contraceptives: 28 pills versus one foil). Administrative data, for which the unit consistency is ensured, may need further standardization if the reported unit of measure does not coincide with that used in the WHO ATC/DDD system. For instance, a drug for which the utilization is reported in milligrams (mg) may have a DDD assigned in grams (g) (e.g., 100 mg = 0.1 g). When the unit of measure does not coincide, it needs to be identified and standardized. The examples provided in this study focus on the use of HMG CoA reductase inhibitors in the ODB program. The following comparative analysis substantiates that the patterns of drug utilization reported are not limited to the ODB program, but are observed in other provincial drug programs, such as New Brunswick and Nova Scotia. As the Figures A2.1–A2.6 indicate, each statin has comparable average RDDs across the three jurisdictions during the 1997-98 to 2006-07 period. The RDD is determined based on the information on the number of days supplied and the strength of the medication dispensed, as reported in the drug plan data. The comparative analysis is limited to these three drug plans due to day supplied information availability over the study period. The examples provided in this study analyze and compare the average RDD for the HMG CoA reductase inhibitors (statins) in the ODB program. The measure of drug use is determined based on the days supplied information reported in the ODB administrative data. An assessment of the quality of this information is conducted in this appendix. Although not specific to the statins, nor the days supplied information, the coding accuracy of administrative drug claims in the ODB database has been assessed ( Levy et al. 2003). According to the assessment, pharmacists almost always dispensed the medication that was prescribed and the information was reliably submitted to the ODB drug claims database. Thus, conclusions drawn by researchers using these data are not likely to be compromised by the reliability of the coding. Statins being oral solid drugs, with generally once-daily recommended dosages in the Health Canada approved product monographs, are expected to require simple coding. Access to ODB data is at the aggregate DIN level. Therefore, this assessment is limited6 to an analysis of trends in the average number of units (pills) per day supplied by each of the unit doses of the drugs analyzed. The results depicted in Figures A3.1–A3.6 indicate that the average number of units per day supplied for all statins and unit doses (strengths) analyzed are slightly above 1, suggesting that statins are generally dispensed once-daily, regardless of the dosage strengths (5 mg, 10 mg, 20 mg, 40 mg or 80 mg), which is in line with the Health Canada approved product monographs. Furthermore, the analysis provided in Appendix 2 concluded that results based on the days supplied information in Ontario are comparable to New Brunswick and Nova Scotia public drug plans. This suggests that there is consistency in reporting and indicates that the days supplied information is reliable. It should be noted that the information reported in the ODB program database is entered at the pharmacy level, as per the medication dispensed. However, it is not known whether the medication was taken by the beneficiary, as reported in the administrative data. 6 A comprehensive quality assessment of the days supplied information can be performed on claim-level data by determining whether the timing (dispensing date) of the subsequent prescription for an individual patient is in line with the timing (dispensing date) and the length (number of days supplied) of the prior prescriptions. The DDDs for statins remained unchanged during the 10-year period analyzed in this study (1997-98 to 2006-07 fiscal years) and through 2008; hence, the WHO ATC/DDD January 2008 edition was used. Effective January 2009, important alterations were made to the DDD for five of the six statins in order to better reflect the current recorded daily dose. This appendix provides a comparison of the new and previous DDD values in the context of the average recorded daily dose (RDD) as observed in the ODB program database. Table A4 compares the previous DDD values (prior to January 2009) to the new DDD values (valid from January 2009) for each statin. The DDDs for atorvastatin and simvastatin have been increased by 100%, whereas for pravastatin, lovastatin and fluvastatin the DDDs have been increased by 50%. There has been no alteration to the DDD for rosuvastatin. From the standpoint of the Canadian administrative databases analysed, the recent alterations represent a much needed adjustment of the DDDs for the top three statins: atorvastatin, simvastatin and pravastatin. By 2006-07, the average recorded daily dose (RDD) for these three drugs in the ODB program became very different than the previous DDD. Nevertheless, the alterations to lovastatin and fluvastatin have resulted in DDD values that are even further from the corresponding RDDs in the ODB program. At the present time, the extent to which the more recent (2008–2009) ODB average recorded daily dose compares to the new DDD for these two drugs is unknown. The WHO assigned value. For instance, the DDD for atorvastain is 10 mg. The treatment regimen that was intended by the physician for the patient and recorded in the prescription. The treatment regimen that was prepared for and given to the patient by the pharmacist. The pharmacist generally dispenses the treatment regimen prescribed by the physician. The physical quantities (e.g., pills) used and reported in the drug program database. The number of milligrams of a drug that has been dispensed on average per day in a given fiscal year as reported in the drug program database. This measure is calculated based on the number of days for which the medication dispensed was supplied and is reported in the “days supplied” information field in the drug plan database. Given that the RDD is calculated based on the days supplied information, the number of RDDs coincides with the number of days supplied as reported in the drug program database. For instance, 100 RDDs of atorvastatin corresponds to 100 days supplied. Refers to drug utilization expressed in DDDs. It is calculated by converting the number of units reported in the data into the number of DDDs, according to the DDD methodology. For instance, 100 DDDs of atorvastatin (DDD = 10) corresponds to 1,000 mg.
7 The prescribed and the dispensed daily dose are expected to be very comparable and often the two are used interchangeably. Nevertheless, they may differ in a population, as some drugs prescribed may not be dispensed. Furthermore, some medication dispensed may not actually be consumed. The prescribed/dispensed daily dose can be determined from prescription studies, medical or pharmacy records, administrative claim records and patient interviews.